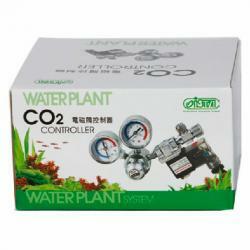 Brief Description: The Ista CO2 Controller with Solenoid will ensure that your planted aquarium will be accurately and reliably dosed with CO2, to ensure the healthy, robust life of your plant inhabitants. With a dual-gauge, easy-to-read display you will know exactly how much CO2 is entering your aquarium, and how much is left in your cylinder. 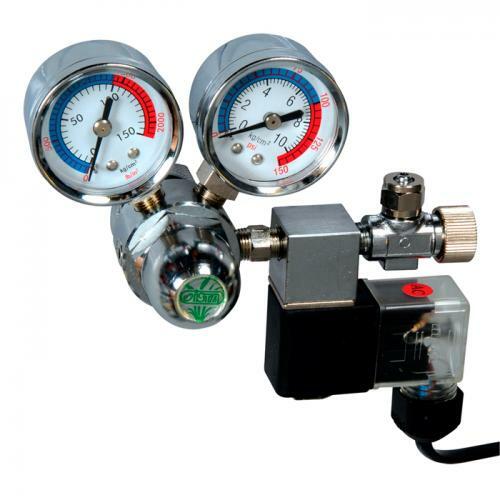 Notify me when "ISTA CO2 Controller with Solenoid [hortizontal mount]" is re-stocked. This controller has been designed for use with face-side CO2 cylinders. Made of high quality stainless steel, it is extremely durable, and rust-proof! This model has been conveniently equipped with a solenoid, allowing it to be used with timers, or other devices. A flash indicator and a safety valve are also included. Absolutely no tools are required for installation! Reduce the CO2 pressure from some 60 bars to approx. 1.5 bar to assure safer operation and obtain accurate and stable CO2 supply desired. Equipped with German-made solenoid with safety valve to prevent danger from over pressure. To prevent back water flow into the CO2 controller, connection with check valve is required. 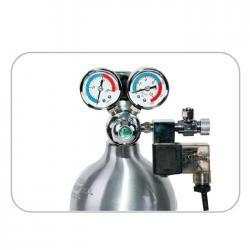 To assure best CO2 bubble reading, using with a ISTA CO2 Bubble Counter is recommended. Be cautious to the falling of the CO2 cylinder which may cause damage to the CO2 Controller.